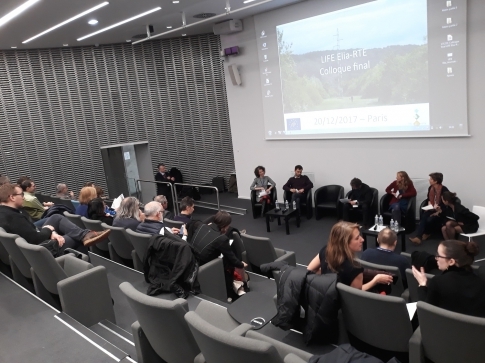 A total of 124 participants registered for the final conference of the LIFE Elia-RTE project co-organised by the LIFE and RTE team on December 20th 2017 in Paris, in the Amphithéâtre du toit de l'Arche in La Défense. The final results of the project were presented and a panel of experts made various presentations related to the theme. 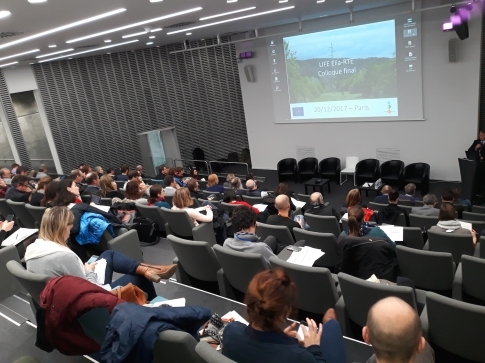 After an opening speech by Jean-François Lesigne (Environment Officer - RTE), Karine Mangin (MTES - Ministry of Ecological and Solidarity Transition) presented the ITTECOP programme: research on biodiversity and infrastructures. The LIFE Elia-RTE team and Viviane Degret (RTE) then presented the LIFE Elia-RTE project, the target and the results obtained. In total, 500 ha of electrical corridors in the forest have been restored for nature in France and Belgium. Then, several French sites were presented: the Finistère site by the LIFE team, the Ardennes site by Michel Colcy (ONF - Office National des Forêts) and André Vincent (Marie de Hargnies), the Hautes-Alpes site by Vanessa Oudart (RTE) and finally the Doubs and Aube sites by Fabrice Naturel (RTE). The LIFE team presented two topics: LIFE Elia-RTE methodology, a scientific approach adapted to the company's challenges: field mapping and biological indicators, and LIFE Elia-RTE, feedback on 6.5 years of project experience and a perspective on the French and Belgian situations. Bernard Chevassus-au-Louis (Humanity and Biodiversity) concluded the morning by presenting his vision in relation to the elements exposed and his personal experience. The afternoon was devoted to a round table during which several experts could express themselves on various subjects: Practical case of ITTECOP programme research: linear infrastructures and biodiversity by Denis François (IFSTTAR), What role for Nature Parks in the challenge electrical transmission and biodiversity by André Vincent (Parc Naturel Régional des Ardennes), La Trame Verte Bleue and projects : tools for stakeholders involved in linear infrastructures (call for pilot project for biodiversity) by Antoine Lombard (MTES), Vision of the European Commission on linear infrastructures and Biodiversity by Nadia Lamhandaz (EU, EASME). Finally, Agnès Labbaye and Lisa Garnier (RTE) presented RTE's commitments to continue the momentum: BELIVE and CILB project. To close the day, François Letourneux (IUCN) gave his "outside look" as a great witness and Nathalie Devulder (RTE) perfectly summarised the day and the major issues discussed. The entire conference is available on our video channel: https://vimeo.com/250617410.